If you happen to live in an agricultural area, you no doubt have heard of the dangers of nitrates in drinking water. All green plants must have nitrogen and nitrates. Without it green plants soon lose their color and die. That is why nitrogen fertilizers are used by farmers to enrich soils for production of field crops such as corn, wheat, soy beans and others. We also use nitrate fertilizers to treat our lawns and home gardens for better results and higher production. Humans can’t metabolize nitrate itself (no chlorophyll), but do utilize nitrogen in some forms from foods that contain nitrogen, especially proteins. The chemical formula for nitrate is (-NO3). This is a non-metallic ion with a negative charge (Anion). In reality it is always connected to a positive ion such as the ammonium ion (+NH4). Our atmosphere is a mixture of several gases but the two largest components are nitrogen (right at 78%) and oxygen (right at 21%). Some other components are carbon dioxide and inert gases such as neon, argon and helium. There are two times when Mother Nature combines nitrogen and oxygen in just the right proportions to produce nitrates; during electrical storms and during snow storms. How Do Nitrates Get Into Our Drinking Water? Nitrates may be carried by rain, irrigation and other surface waters through the soil into ground water. Animal waste as well as human waste can also contribute to nitrate contamination of ground water. 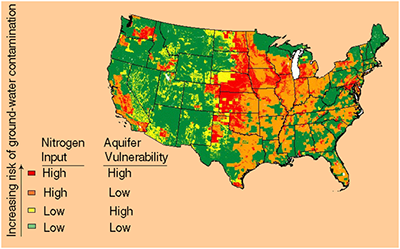 Agricultural practices have been linked to elevated levels of nitrates in drinking water. Although any well can become contaminated by nitrates, those that are shallow, poorly constructed, or improperly located (near cattle lots for example) are more susceptible to contamination. Nitrate levels in drinking water can also be an indicator of overall water quality. Elevated nitrate levels may suggest the possible presence of other contaminants such as disease-causing organisms, pesticides, or other inorganic and organic compounds that could cause health problems. When anaerobic bacteria “steal” an oxygen atom from a nitrate ion, it produces a new smaller ion call nitrite (-NO3). Laboratories can routinely perform water tests to show the possible presence of nitrate and/or nitrite in water. 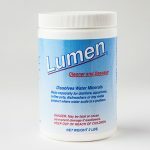 There is also an inexpensive and easy to use home water test available. If a homeowner suspects that nitrates and/or nitrites could be present in their drinking water, testing should be done at least twice a year, early spring and early fall. This nitrate water test is available through Pure and Secure, LLC. The nitrogen cycle represents and explains one of the most important nutrient cycles found in Earth’s ecosystems (Figure 1). Nitrogen is used by living organisms to produce a number of complex organic molecules like amino acids, proteins, and nucleic acids. The store of nitrogen found in the atmosphere, where it exists as a gas (mainly N2), plays an important role for life. This store of nitrogen is about one million times larger than the total nitrogen contained in living organisms. Other major stores of nitrogen include organic matter in soil and the oceans. Despite its abundance in the atmosphere, nitrogen is often the most limiting nutrient for plant growth. This problem occurs because most plants can only take up nitrogen in two solid forms: ammonium ion (NH4+ ) and the ion nitrate (NO3- ). Most plants obtain the nitrogen they need as inorganic nitrate from the soil solution. Ammonium is used less by plants for uptake, because in large concentrations it is extremely toxic. Humans and many other types of animals receive the required nitrogen they need for metabolism, growth, and reproduction by the consumption of living or dead organic matter containing molecules composed partially of nitrogen. 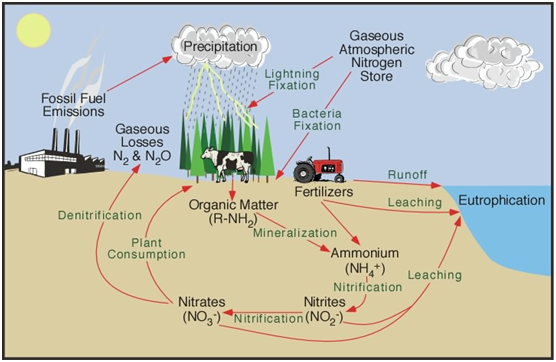 There are many other aspects of the nitrogen cycle, but almost all of the nitrogen found in our terrestrial ecosystem originally came from the atmosphere. Significant amounts enter the soil in rainfall or through the effects of lightning. The majority, however, is biochemically fixed within the soil by specialized micro-organisms like anaerobic bacteria. They can’t tolerate free oxygen and must obtain oxygen from a combined source. The excess application of nitrogen fertilizers to crops has caused increased rates of denitrification and leaching of nitrate into groundwater which eventually flows into streams, rivers and lakes. Livestock ranching (cattle, hogs, chickens and turkeys). Livestock release a large amounts of ammonia into the environment from their wastes. This nitrogen enters the soil system and then the hydrologic system through leaching, groundwater flow, and runoff. Who Is At Risk From High Nitrates In Water? The Environmental Protection Agency (EPA) has set the Maximum Contaminant Level (MCL) of nitrate as nitrogen (NO3-N) at 10 mg/L (or 10 parts per million) for the safety of drinking water. The MCL for nitrite is 1.0 mg/L part per million. Pregnant women, especially in their first trimester, and their developing embryos are at the highest risk for nitrate/nitrite poisoning. This is the critical time for the development of healthy organs. Shortage of oxygen at that time can result in birth defects. Nitrate and nitrite levels at or above the respective MCL levels have also been known to cause a potentially fatal blood disorder in infants under six months of age called methemo-globinemia or “blue-baby”. The red blood cells are being robbed of oxygen on the hemoglobin by the nitrites in their blood streams. The symptoms of blue-baby syndrome can be subtle and often confused with other illnesses. An infant with mild to moderate blue-baby syndrome may have diarrhea, vomiting, and/or be lethargic. In more serious cases, infants will start to show obvious symptoms of cyanosis: the skin, lips or nail beds may develop a slate-gray or bluish color and the infant could have trouble breathing. A sample of the infant’s blood can easily confirm a diagnosis of blue-baby syndrome. It is difficult to determine the true incidence of blue-baby syndrome because it is not a reportable disease. This condition is fairly easily and quickly corrected with oxygen treatment. If not promptly treated, it can lead to infant death. Others who are at risk for nitrates/nitrites are those with a compromised immune systems. The elderly, transplant patients and AIDs patients are prime examples. In these cases, the nitrites have combined with amino acids to form nitrosamines, which often cause colon or intestinal cancer. Needless to say nitrates and nitrites are definitely water contaminants that need to be removed from the water that humans and animals consume. Boiling water does NOT remove these contaminants, in fact it concentrates them. 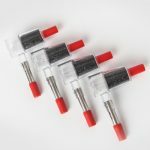 Removing nitrates from water with activated carbon filters is not possible. Ion exchange using cation resins (water softening) doesn’t work either. 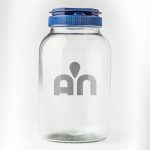 Ion exchange using anion resins work to some degree, but is not well proven for household use. Reverse osmosis is not recommended, since bacteria in the carbon filters and on plastic membrane can actually increase the anaerobic bacteria, actually increasing the nitrite risk. Chemical treatment is also not advised. That leads us to water distillers. 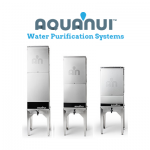 Distillation systems like AquaNui are 99.9% effective in the removal of nitrates, nitrites and virtually every other contaminant.